Use the following information to answer questions 1−5. A student titrates 20.0 mL of 1.0 M NaOH with 2.0 M formic acid, HCO2H (Ka=1.8×10−4). 1. How much formic acid is necessary to reach the equivalence point? 2. At the equivalence point, is the solution acidic, basic, or neutral? Why? 3. If the formic acid were replaced with a strong acid such as HCl at the same concentration (2.0 M), how would that change the volume needed to reach the equivalence point? (A) The change would reduce the amount as the acid now fully dissociates. (B) The change would reduce the amount because the base will be more strongly attracted to the acid. (C) The change would increase the amount because the reaction will now go to completion instead of equilibrium. (D) Changing the strength of the acid will not change the volume needed to reach equivalance. 4. Which of the following would create a good buffer when dissolved in formic acid? 5. In which pH range would a buffer made with formic acid be the most effective? Use the following information to answer questions 6−10. 6. What is the expression for the equilibrium constant, Kc? 7. Which of the following would cause the reverse reaction to speed up? 8. The value for Kc at 25°C is 8.1. What must happen in order for the reaction to reach equilibrium if the initial concentrations of all three species was 2.0 M? (A) The rate of the forward reaction would increase, and [SO3] would decrease. 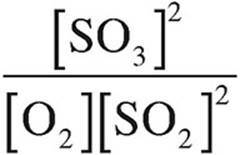 (B) The rate of the reverse reaction would increase, and [SO2] would decrease. (C) Both the rate of the forward and reverse reactions would increase, and the value for the equilibrium constant would also increase. (D) No change would occur in either the rate of reaction or the concentrations of any of the species. 9. Which of the following would cause a reduction in the value for the equilibrium constant? 10. Which of the following statements best describes the thermodynamic favorability of the reaction at 25°C? (A) The reaction is favored and driven both by enthalpy and entropy changes. (B) The reaction is favored but is only driven by enthalpy changes. (C) The reaction is favored but is only driven by entropy changes. (D) The reaction is not favored. 11. The solubility product, Ksp, of AgCl is 1.8×10−10. Which of the following expressions is equal to the solubility of AgCl? 12. A 0.1-molar solution of which of the following acids will be the best conductor of electricity? 13. Which of the following expressions is equal to the Ksp of Ag2CO3? 14. If the solubility of BaF2 is equal to x, which of the following expressions is equal to the solubility product, Ksp, for BaF2? 15. A beaker contains 50.0 mL of a 0.20 M Na2SO4 solution. If 50.0 mL of a 0.10 M solution of Ba(NO3)2 is added to the beaker, a precipitate of BaSO4 will form. What will be the final concentration of the sulfate ions in solution? 16. The solubility of strontium fluoride in water is 1 × 10−3 M at room temperature. What is the value of the solubility product for SrF2? 17. When 300. mL of a 0.60 M NaCl solution is combined with 200. mL of a 0.40 M MgCl2 solution, what will be the molar concentration of Cl− ions in the solution? 18. A student added 1 liter of a 1.0 M KCl solution to 1 liter of a 1.0 M Pb(NO3)2 solution. A lead chloride precipitate formed, and nearly all of the lead ions disappeared from the solution. Which of the following lists the ions remaining in the solution in order of decreasing concentration? 19. The solubility of PbS in water is 3 × 10−14 molar. What is the solubility product constant, Ksp, for PbS? A gaseous reaction occurs and comes to equilibrium as shown above. Which of the following changes to the system will serve to increase the number of moles of I2 present at equilibrium? At equilibrium, there was 1 mole of CH3OH in the container. What was the total number of moles of gas present in the container at equilibrium? 22. A sample of solid potassium nitrate is placed in water. 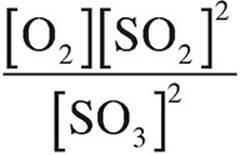 The solid potassium nitrate comes to equilibrium with its dissolved ions by the endothermic process shown below. Which of the following changes to the system would increase the concentration of K+ ions at equilibrium? (A) The volume of the solution is increased. (B) The volume of the solution is decreased. (C) Additional solid KNO3 is added to the solution. (D) The temperature of the solution is increased. If the equilibrium concentration of Cl2 was found to be 0.1 M, which of the following best approximated the value of Keq at 350°C? The reaction above came to equilibrium at a temperature of 100°C. At equilibrium the partial pressure due to NOBr was 4 atmospheres, the partial pressure due to NO was 4 atmospheres, and the partial pressure due to Br2 was 2 atmospheres. What is the equilibrium constant, Kp, for this reaction at 100°C? At 150°C, the equilibrium constant, Kc, for the reaction shown above has a value of 300. This reaction was allowed to reach equilibrium in a sealed container and the partial pressure due to IBr(g) was found to be 3 atm. Which of the following could be the partial pressures due to Br2(g) and I2(g) in the container? Initially, a sealed vessel contained only H2(g) with a partial pressure of 6 atm and CO2(g) with a partial pressure of 4 atm. The reaction above was allowed to come to equilibrium at a temperature of 700 K. At equilibrium, the partial pressure due to CO(g) was found to be 2 atm. What is the value of the equilibrium constant Kp, for the reaction? 27. What is the volume of 0.05 M HCl that is required to neutralize 50 mL of 0.10 M Sr(OH)2 solution? 29. A laboratory technician wishes to create a buffered solution with a pH of 5. Which of the following acids would be the best choice for the buffer? 30. Which of the following species is amphoteric? 31. How many liters of distilled water must be added to 1 liter of an aqueous solution of HCl with a pH of 1 to create a solution with a pH of 2? 32. A 1-molar solution of a very weak monoprotic acid has a pH of 5. What is the value of Ka for the acid? 33. The value of Ka for is 1 × 10−2. What is the value of Kb for ? 34. How much 0.1-molar NaOH solution must be added to 100 milliliters of a 0.2-molar H2SO3 solution to neutralize all of the hydrogen ions in H2SO3? Use the following information to answer questions 36-39. 36. Why is the solution acidic at equilibrium? 37. What it the concentration of the acid? 38. What is the pKb of the base? 39. What ions are present in significant amounts during the first buffer region? 1. The value of the solubility product, Ksp, for calcium hydroxide, Ca(OH)2, is 5.5 × 10−6, at 25°C. (a) Write the Ksp expression for calcium hydroxide. (b) What is the mass of Ca(OH)2 in 500 mL of a saturated solution at 25°C? (c) What is the pH of the solution in (b)? (d) If 1.0 mole of OH− is added to the solution in (b), what will be the resulting Ca2+ concentration? Assume that the volume of the solution does not change. 2. For sodium chloride, the solution process with water is endothermic. (a) Describe the change in entropy when sodium chloride dissociates into aqueous particles. (b) Two saturated aqueous NaCl solutions, one at 20°C and one at 50°C, are compared. Which one will have higher concentration? Justify your answer. (c) Which way will the solubility reaction shift if the temperature is increased? (d) If a saturated solution of NaCl is left out overnight and some of the solution evaporates, how will that affect the amount of solid NaCl present? The acid dissociation constants for the reactions above are given at 25°C. (a) What is the pH of a 0.050-molar solution of H2CO3 at 25°C? (b) What is the concentration of CO32− ions in the solution in (a)? (c) How would the addition of each of the following substances affect the pH of the solution in (a)? (a) Write the expression for Kc and calculate its value. (b) Calculate ∆G for this reaction. (i) The temperature is increased. (ii) The volume of the reaction chamber is increased. (iii) N2 gas is added to the reaction chamber. (iv) Helium gas is added to the reaction chamber. 5. A vessel contains 500 milliliters of a 0.100-molar H2S solution. For H2S, K1=1.0 × 10−7 and K2=1.3 × 10−13. (a) What is the pH of the solution? (b) How many milliliters of 0.100-molar NaOH solution must be added to the solution to create a solution with a pH of 7? (c) What will be the pH when 800 milliliters of 0.100-molar NaOH has been added? 6. A 100 milliliter sample of 0.100-molar NH4Cl solution was added to 80 milliliters of a 0.200-molar solution of NH3. The value of Kb for ammonia is 1.79 × 10−5. (a) What is the value of pKb for ammonia? (b) What is the pH of the solution described in the question? (d) If equal molar quantities of NH3 and NH4+ were mixed in solution, what would be the pH of the solution? 7. A student performs an experiment to determine the concentration of a solution of hypochlorous acid, HOCl (Ka=3.5 × 10−8). The student starts with 25.00 mL of the acid in a flask and titrates it against a standardized solution of sodium hydroxide with a concentration of 1.47 M. The equivalence point is reached after the addition of 34.23 mL of NaOH. (a) Write the net ionic equation for the reaction that occurs in the flask. (b) What is the concentration of the HOCl? (c) What would the pH of the solution in the flask be after the addition of 28.55 mL of NaOH? (d) The actual concentration of the HOCl is found to be 2.25 M. Quantitatively discuss whether or not each of the following errors could have caused the error in the student’s results. (i) The student added additional NaOH past the equivalence point. (ii) The student rinsed the buret with distilled water but not with the NaOH solution before filling it with NaOH. 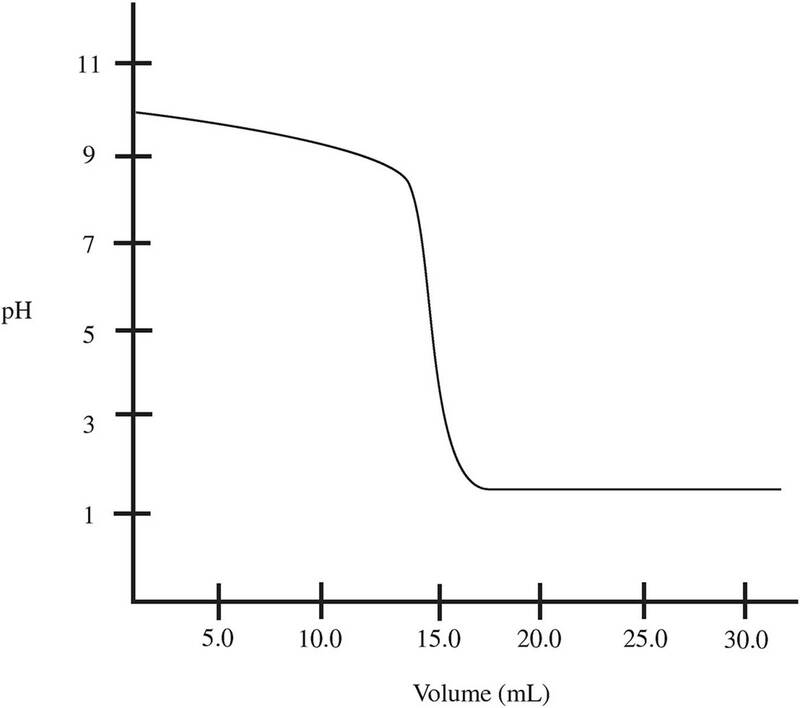 (iii) The student measured the volume of acid incorrectly; instead of adding 25.00 mL of HOCl, only 24.00 mL was present in the flask prior to titration.